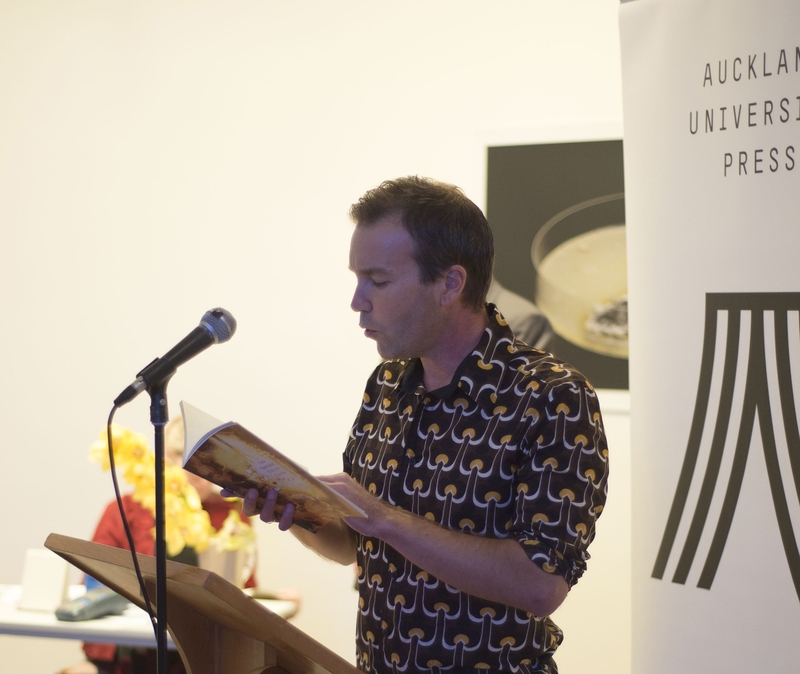 Auckland University Press recently published Sam Sampson’s second poetry collection, Halcyon Ghosts. To celebrate this, Sam agreed to answer some questions for Poetry Shelf. I will post a review shortly. Did your childhood shape you as a poet? What did you like to read? What else did you like to do? I’m not sure my childhood shaped me as a poet. I had a pretty ordinary white middle-class NZ upbringing, living out in the wops (as the Waitakeres were called in those days). But now, looking back at the books, plus audio and visual stimulus, maybe there is a correlation to what I’m up to now. Early on I was introduced to nursery rhymes from both grandmothers, and from books that survive, a combination of traditional fairy tales and fables. I also remember being an avid listener of the radio (1ZB stories) on a Sunday morning. As much as these stories peppered my imagination there was the environment I grew up in at the bottom of South Titirangi Rd in West Auckland. There were the kauri, the tea-tree, the wood pigeons, tui…the Manukau (Jenkins Bay) on one side, and Little Muddy Creek on the other. As a child I had a magical upbringing. I swam in Little Muddy Creek, kayaked over to the dairy at Laingholm to buy ice cream, climbed trees, went fishing with uncles and friends…swam, surfed at Karekare, Piha, Anawhata, Whites, Whatipu, Bethells…. When you started writing poems as a young adult, were there any poets in particular that you were drawn to (poems / poets as surrogate mentors)? I didn’t start out writing poems but song lyrics, which I suppose were early poems of a sort. A number of the songwriters I admired had either published prose, or poems, so I started to search out poets and thinkers they referenced. In my late twenties I started sending poems out to poets and magazines. I flatted in a house where the owners had gone overseas and left an extensive library at our disposal. I remember reading Wallace Stevens (being transfixed by ‘The Man with the Blue Guitar’), William Carlos Williams, Hans Magnus Enzensberger, Walt Whitman, James K. Baxter, Stephen Spender, Michael Ondaatje, and The Penguin Book of New Zealand Verse (edited by Ian Wedde and Harvey McQueen). It was here I discovered the poems of Allen Curnow and started to seek out his work, partly I think because of the discursive line he wrote, but also because of his distinctive and recognisable images of Karekare on Auckland’s West Coast, which had been familiar to me right through childhood. Later, after discovering my great-uncles were early members of the Karekare Surf Patrol, and my grandfather (a mechanic) repaired the surf club trucks, this gave a gravitas of sorts to the environs I grew up in and anchored the familial with Curnow’s type of philosophical topography. In 1999 I sent an early batch of poems to Allen Curnow and received back a reply, where he wrote, amongst other things, that I’d sent him quite a remarkable variety of ‘contruptions’ (Auden’s word). Now, for me I was overwhelmed that Allen Curnow had taken the time to read my work and respond, but I couldn’t work out this mysterious word of Auden’s: ‘contruptions’ – was it like an interruption contrariwise, a continuing interruption, or disruption – or some other fantastical Auden word? At the Auckland Readers and Writers Festival in May of 2001 I went to hear Allen Curnow read, and afterwards, queued to get my copy of Early Days Yet signed. When I reached the signing table I introduced myself, and as he was a little hard of hearing, repeated loudly and a number of times that he’d said my poetry was a series of contruptions (Auden’s word). He looked at me quizzically, and said, you mean ‘contraptions’…. it was then I realised his spidery, looping handwriting had turned the ‘a’ to a ‘u’. For two years I’d imbedded the notion of my poetry as being christened by Allen Curnow as a series of contruptions. Today it seems appropriate; maybe my work is a series of ‘contruptions’, somewhere in between a contraption, a disruption, an inter-ruption. That is wonderful! Like a mishearing. Did university life (as a student) transform your poetry writing? Yes, it was an immersive shock to the system. Not so much in the area of poetry writing but more the eclectic mix and match of subject matter. At the time I did my BA, and MA (I combined both papers in Philosophy and Ethnomusicology) I was lucky enough to have full year papers and this left enough time to explore a subject, to read books associated with the syllabus. This journey of discovery was the reason I found my way to literature, and especially to philosophers and poets. While studying, I took a part-time job as a roadie and stage assistant for the local orchestra (The Auckland Philharmonia). For eight years I had access to a wonderful roster of orchestral rehearsals and performances. I couldn’t tell you exactly how it influenced my work, but talking and listening to musicians, conductors, and composers gave me a sense of how music could lift the notes off the page. I felt that as poetry is built around shifts of tempo and modulations of pitch, every gesture was connected to meaning and is an intuitive way of sound sculpting. This is not to say I felt poetry (my poetry especially) should ever purely be of the sound poetry tradition. I felt meaning inherently tied at the initial compositional stage, but this structure could be extended, until in some cases only a shimmer of the original meaning was left behind. You have an MA in Philosophy and I do see philosophical undercurrents in your poetry — you are unafraid of embedded ideas. How do you view the relationship between philosophy and poetry in your own writing? I love the way your poems exude joyfulness. In the power of words to delight and astound. To take us to unexpected places, poetry as an archaeological dig. What are key things for you when you write a poem? Do you think your writing has changed since your debut collection? Yes, definitely the writing has changed but carries over frames and referents from the last collection…my flow is going with time…as Leigh Davis wrote. I see myself as writing one book of poetry, with of course variations within the body of work. Looking at this book I see a synchronicity, what others have called an analytic lyricism. I can join more dots when looking at the book as a whole, but saying that, I’m not sure how to describe the poems. It seems reasonable primary facts have been lost, other facticities I have created to replace forgotton fact, certain memories I have erased, or chosen to omit. When trying to chart poems, frames of reference will only take me so far, and images make me believe there was an event connected to each and every poem. I hope in this body of language I’ve let the subjects find themselves and inadvertently resurrected the dead. The dead here, I take to mean, not just those that have passed away during the writing of this book, but also the language that has been unearthed, the unearthed vestiges. In coaxing this book into existence my maternal grandmother died, my daughter was born, and at the end of January, I took my father home to die. This book means something, but at the moment I’m too close to it, and I’m just not sure what, or even if it will ever be accessible to me. People have told me my poetry will alter, not by any act of will, but because of a process, a process whereby living inevitably reconfigures one’s relationship to the world and to one’s sense of mortality and life. This book is a type of reel, a reel of life… in my beginning is my end… and the halcyon ghosts that manifest in this circuitry of life, live beyond their deaths – where names displaced by light / are dark but not lost…. Michael Hulse recently queried the status of certain poems in a review he did for New Zealand Books. In his mind, some poems weren’t in fact poems. How would you define poetry? I’m not sure, as I haven’t seen that particular review. I know Michael and he is a very good poet and critic. I know from my perspective everything I set up to write as a poem, is a poem. I’m thinking here in the area of the conceptual arts, where Duchamp’s Fountain (porcelain urinal) is in fact an artwork when placed in the context of the gallery. I admire the work Kenny Goldsmith is doing with his ‘Uncreative Writing’ model, although I find it hard to produce pure conceptual work along those lines (I wrote a little more about this if anyone is interested: A Response). So to answer your question, I think it depends on the framework you set-up for ‘poetry’, and to my mind anything is possible. …when one thinks or hopes one had brought off a poem of one’s own uncontaminated, it looks, at first, so utterly unlike anything one has ever read that one is worried about it – this can’t be poetry at all, it’s a curious sort of uncouth gangling kind of thing, and yet this is how it turned out. What has usually happened is that poem is definitely one’s own. This doesn’t necessarily mean it’s good, only it’s one’s own. At times dislocating in the sway between deeply familiar and disconcertinly not so. You have turned to the shape poem in your new collection. When I first opened your book, it felt like I was entering a field of beauty — in the formation of the poems on the page and the phrases snared in the corner of my eye. What fascinated you about shape poems? I love the phrase on the back of your book, ‘thirteen shapes of knowing.’ Can you expand upon this? Thirteen, consciously, and unconsciously, became an important touchstone throughout the book. There are thirteen poems in the book, the cover still La lampada della nonna (Grandmother’s Lamp) was produced in 1913, there are references to thirteen lunar cycles, thirteen ways of looking at a blackbird, the sun travelling thirteen degrees across the sky, McCahon’s number poems, Rothko’s number titled poems, plus many of the stanzas add up to thirteen; for example: ‘The Tombstone Epitaph’ is written in XIII stanzas…thirteen ways, or cinematic vignettes of looking at the famous gunfight at O.K. Corral, and the subsequent pursuit of the Earp gang. Throughout Halcyon Ghosts, I also looked to number thirteen as a graphical representation, which I hoped may move the reader to see the poem as more than just a semantic meandering, and as much, a symbolic, or figurative representation of this numerical value. Just to continue with the numerological, or repetitive arrangement of the book; this book is dedicated to my maternal grandmother, and my daughter. My daughter Lucia, was born on Friday 13th, at 1:13 in the morning, in Room 13 at Auckland Hospital; my grandmother was born in London, on March 13th, 1920, and died in Auckland, on December 13th, 2009. The idea of repetition, of a loosely constructed numerical frame is part of the circuitry that makes up this book. I hoped the poems were both spontaneous and exacting – a reel of real…a dancing in chains. Coincidentally, Halcyon Ghosts was launched on Friday 13 June and my last book Everything Talks, was also launched on Friday 13 June, six years earlier. What NZ and international poets have mattered to you over the past year? Much of my reading is grazing online journals and blogs, reading what’s there in front of me. The books on a small shelf next to my desk are books I revisit, or recent purchases…(on the shelf at this moment): Barbara Guest; Paul Muldoon; Wallace Stevens; John Ashbery; Gustaf Sobin; Geoffrey Hill; Peter Cole; John Cage; C.K.Stead; Michael Palmer; Murray Edmond; Anne Kennedy; Ian Wedde; T.S.Eliot; John Keats; Alice Miller; Samuel Beckett; Eliot Weinberger; Keith Waldrop; Leigh Davis; Zach Savich; Elisa Gabbert. The constant mantra to be a better writer, is to write, write, write and read, read, read. You also need to live! What activities enrich your writing life? At the moment it’s a busy bustling lifestyle, looking after my nearly four-year-old girl (who now insists the next book must contain at least one ‘dinosaur’ poem!). The beginning of this year was particularly demanding, working towards this publication and caring for my father who died in January. In the summer months I try to spend as much time at the West Coast beaches and Waitakere Ranges. I love swimming in the ocean, and through November–April, I swim with a couple of friends at Cornwallis Beach at the Manukau Harbour entrance. There’s something invigorating about bobbing about in the ocean five hundred or so metres offshore and looking back. I’m also a keen sea kayaker and in March was lucky enough to spend four days kayaking in the Coromandel, in and around Cathedral Cove, and then in late April, four nights kayaking the magical Tutukaka coastline…Rocky Bay…Matapouri Bay…Whale Bay…. Yes, do try a dinosaur poem for her! Finally if you were to be trapped for hours (in a waiting room, on a mountain, inside on a rainy day) what poetry book would you read? I was trapped in a hospital waiting room waiting for my mother who had an appointment. I think I was there for about five hours and luckily had just received in the mail the second volume of Robert Creeley’s Collected Poems 1975–2005 that starts with the poem, ‘Wellington, New Zealand’. It was a great read, but I prefer his first Collected (1945–1975) more for the radical and influential shifts in register. The most important act of a poem is to reach further than the page so that we are aware of another aspect of art…. what we are setting out to do is delimit the work of art so that it appears to have no beginning and no end, so that it overruns the boundaries of the poem on the page. Thanks for such generosity of response Sam. This entry was posted in Poetry and tagged NZ poet, o, poetry interview, Sam Sampson on July 3, 2014 by Paula Green.